Starting today, we will offer all day walk-ins for advising in the Undergraduate Program Office. If you are a CM student with 60+ credits, please see the walk-in schedule to determine the best time to meet with your advisor and have your hold removed. Appointments will resume on Wednesday, November 13 – and an appointment can be scheduled now for that day (or later). If you have not yet had your advising hold lifted, you will need to do so before you can enroll in Spring 2015 courses. Please plan to attend walk-ins to discuss your spring enrollment plans and have your hold removed. U-ACCESS (Office of Urban and Off-Campus Support Services) was established since 2012 to provide comprehensive support and advocacy services to UMass Boston students who may be experiencing homelessness, emancipation from foster care, parental neglect, chronic or persistent poverty, domestic violence, legal issues, financial emergencies, or other unanticipated events in their lives. The office employs a multi-disciplinary approach to assist students who are dealing with a multitude of issues. The office collaborates with other campus units and programs, such as Academic Support Services, the Campus Kitchen at the University of Massachusetts Boston, the College of Public and Community Services, the Office of the Dean of Students, the Office of Public Safety, and University Health Services. In addition, U-ACCESS coordinates efforts with off-campus service providers and organizations around the Greater Boston area. Community partners provide students with available resources and services beyond what the campus may offer. The ultimate goal of the U-ACCESS is to support students so that they can achieve academic success without being derailed by complex non-academic issues in their lives. Hopefully, with such support, these students will successfully complete their degrees at UMass Boston, stop the cycle of poverty and educational attrition, and improve their life choices and opportunities. The Office of U-ACCESS is collaborating with the College of Management seeking a part time, 9-month (fall and spring semesters) volunteer/intern to work in creating a financial management curriculum and to provide 1 on 1 services with U-ACCESS student clients on an as-needed basis. This position consists of two parts: volunteering in the fall semester and an internship in the spring semester. This partnership will give the student intern the opportunity to develop a pilot project with the office of U-ACCESS and individualize financial plans for student clients in a variety of financial hardships, and counsel clients on how to best budget and manage their limited financial means. Research existing financial literacy or financial management curriculum suitable for college students population. Modify and/or create a U-ACCESS financial planning curriculum for UMass Boston students. Test the curriculum with pilot student participants. Develop client centered financial plans based on individual needs and goals of the client. Encourage money consciousness habits for clients by developing budgets, setting goals, and establishing check-ins for clients to assess their progress. Meet with clients on a bi-weekly basis. Develop financial counseling portfolio, (program) and train subsequent interns. Maintain confidentiality of client information throughout the process and after counseling has concluded. Ensure secure storage of all client data, and follow best practices for timely destruction of sensitive materials. Interns will be under the supervision of the Director of U-ACCESS, and report weekly on the status and outcomes of client meetings. Interns will also be expected to attend short orientation session prior to starting internship. Email your resume to Shirley Fan-Chan, Director of U-ACCESS at: shirleyfanchan@umb.edu. This position is posted in My Career Online as job order ID # 22052. Please Contact Shirley Fan-Chan at U-ACCESS by email shirleyfanchan@umb.edu or by phone 617-287-3195 if you have further questions about the volunteer/internship opportunity. Management majors may earn MAP miles for this experience, please contact mapcm@umb.edu for more details. If applicant wishes to use this internship for academic credit in their Management Major for the Spring 2015, students must also complete the Internship for Academic Credit process located in the CM Student Resources Page of the College of Management’s Website. Contact upo@umb.edu for more information. College of Management students are required to participate in the Management Achievement Program (MAP). Students in MAP must complete 75% of their required MAP miles before registering for MGT 490. You can view your earned MAP Miles by logging on to the CMWeb, as well as view a schedule of upcoming events there and here on the blog (MAP page or weekly posts). It is important to note that we cannot save a spot in MGT 490 for someone planning to complete their MAP miles, or register students with fewer than 75% of their miles earned. Once all pre-requisites for MGT 490, including MAP Miles, are earned, students should be able to register themselves for MGT 490 on Wiser. As you start to think about your schedule for the upcoming term, you should also be sure that you have completed all necessary placement exams. If you plan to take a BC course (either BC 230 or BC 290), you will need to take the College of Management Writing Assessment (CMWA). If you plan to take your first math course at UMB, or your first math course in over a year, you will need to take the ALEKS Math Placement Exam (MPE). This testing format was introduced in May 2014 and can now be done at home – or any where you have computer access – not just the UMB Testing Center. If you have not yet taken a placement exam, we’d encourage you to do so as soon as possible – and if you want to improve your score or further your understanding of certain math concepts, use the learning modules in ALEKS. This is great resource for students. The CMWA, MPE and Spanish placement exams are all available through the UMass Boston Testing Center. These are the MAP Events for the week of October, 26th 2014. Fundamental Laws of Investing. Starts at 12:00 PM in W-1-0064. MAP Miles earned: 50. State Street Opportunities Information Session. Starts at 2:00 PM in Ryan Lounge: m-3-721. MAP Miles earned: 50. Concord Wealth Management Presents: Financial Literacy. Starts at 6:00 PM M-1-409. MAP Miles earned: 50. Advanced Linked-in Workshop. Starts at 9:30 AM in Purple Lab: H-UL-004. MAP Miles earned: 50. On Campus Interview Prep. Starts at 2:00 PM in CC-2-2545. MAP Miles earned: 50. The College of Management welcomes Harvard Pilgrim Vice President Vin Capozzi to discuss current topics in healthcare administration and the impacts of new laws on their business. MAP Miles: 75. The Smart Grid and Clean Energy: Challenges and Opportunities for Utilities, Clean Tech, and Carbon Emissions. Starts at 5:30 PM in Ryan Lounge: M-3-721. Response required for this event. The event capacity is 100. MAP Miles earned: 75. City Year Employer Information Session. Starts at 2:00 PM in CC-1-1110. MAP Miles earned: 50. Becker CPA– Exam Information Session. Starts at 3:00 PM in M-02-0116. MAP Miles earned: 50. If you have an interest in Sales, Marketing, or Entrepreneurship, please join us at 6:30 pm on Thursday, October 30th at LaunchSource’s facility at the UMass Boston Venture Development Center. Mark Roberge, Chief Revenue Officer at Hubspot will be speaking about the Sales Acceleration Formula that he developed at Hubspot through using data, technology, and inbound selling to go from $0 to $100 Million. Come hear Mark’s story, best practices, and advice that will help propel you, your company, and your career to new heights! 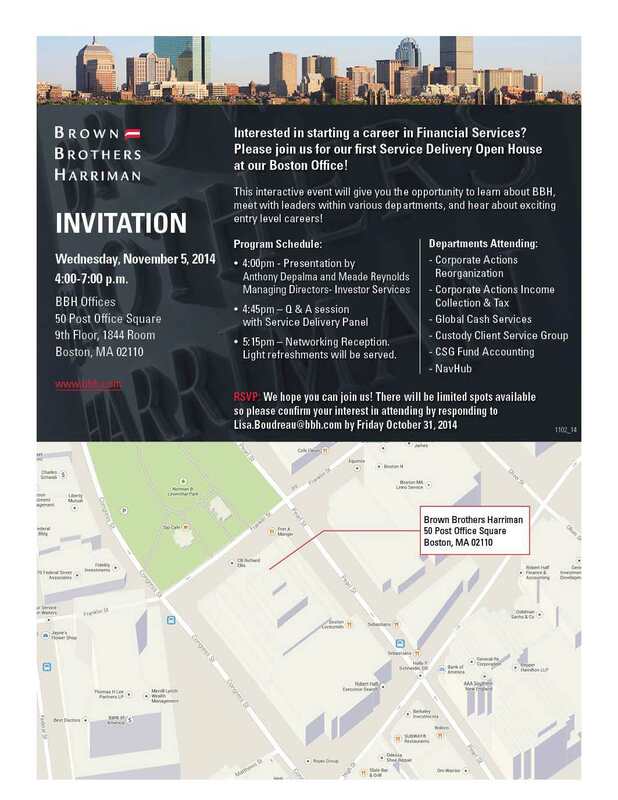 In addition to Mark’s talk, this should be an excellent opportunity to network with other entrepreneurial leaders within Boston’s high-growth technology sector. Please reserve your ticket in the link below as seats are limited. Please feel free to share this invite with others that may be interested in attending as well. Thanks and we hope to see you there! This prep session is the second step in obtaining a summer internship with INROADS. The first step is to go to their website: www.inroads.org and click on “students” and the “apply online” link. Read the directions and qualifications completely, then follow the steps to start the application process, including having your resume & transcript ready to upload. Make sure you choose Option 1 – College Students. Jamoul Celey and his INROADS staff are available to help you with the application process if you run into trouble or have questions about your next steps. He can be reached at: jceley@inroads.org. Jamoul will be back on campus on November 12th and 19th from 12pm-2pm to help students complete their Mock Interview, which is the 3rd step in the internship process. The Mock Interview Workshops will be conducted in Career Services (CC-1-1300). Sign up via My Career Online. 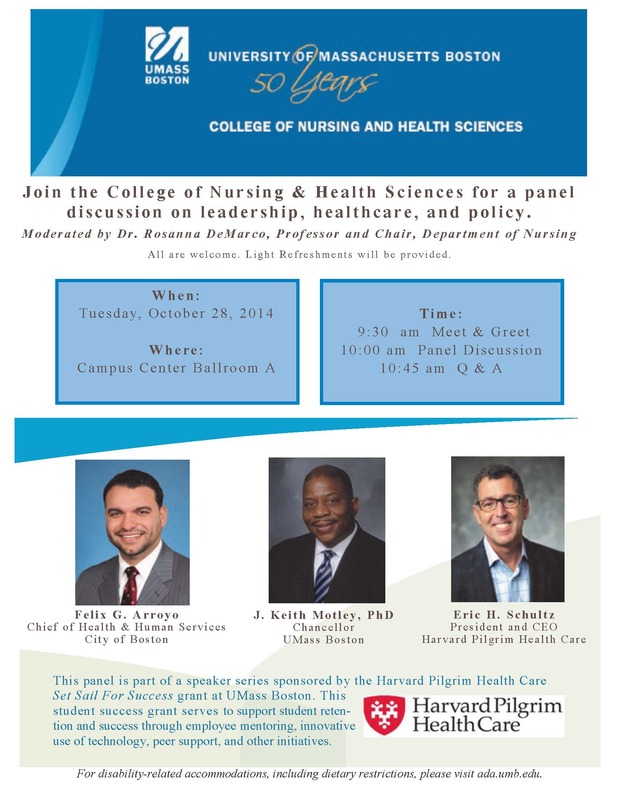 If you have questions about these workshops please contact Career Services at 617-287-5519. Comments Off on HOLD on a minute! Registration for the Spring 2015 semester starts on November 3 for students with 100+ credits (and continues to open for all students throughout November). To see if you have any holds, log on to Wiser, go to the Student Center page, and check the blue sidebar menu on the right. One box will say “Holds” and list any that you might have. Holds can go onto your account at any time, so you should check here periodically. You are encouraged to remove these NOW, so that when your registration appointment arrives, you can enroll in spring 2015 classes with as few obstacles as possible.